This picture collage is from today's March and Rally in Central London. 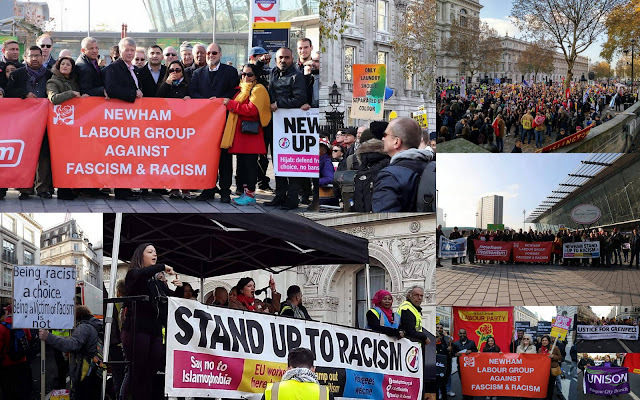 Newham Labour Councillors, Party members & supporters met in the morning outside Stratford Station in order to travel down together to the march. While we were gathering there was a series of speeches including our London Assembly member Unmesh Desai and a young person, 10 year old Unais, who reminded us that the same hearts beat under our skins regardless of race or colour. I also gave a short speech reminding everyone that only last Sunday many of us had attended ceremonies remembering those who died defending us against fascists and in November 1940 fascists bombers had rained bombs on London including Stratford, killing thousands of Londoners. We must never forget this and always fight fascism and racism in all its forms. The march formed in Portland Place near the BBC headquarters. I helped carry the West Ham Labour Party banner with my ward Councillor John Whitworth (and others). At the end of the march there was a rally in Whitehall (near Downing Street) and a number of speeches including that of our Newham Mayor, Rokhsana Fiaz, who passionately attacked all supporters of hate in our society.